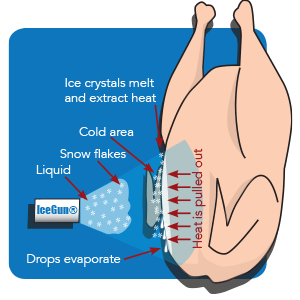 The poultry is sprayed with wet ice crystals or “snow”, targeting the areas that most need increased chilling; the inner cavity, breast and legs, difficult-to-reach folds in the skin, and the area surrounding the neck. 82x, that’s how much more chilling capacity ice has over water, making it ideal to increase the chilling speed in chosen parts of the poultry. 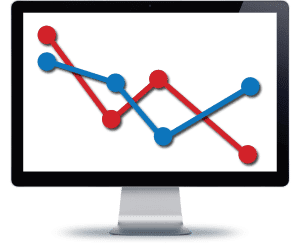 This is a fully in-line solution made to complement existing chilling lines to improve their efficiency, achieve more rapid chilling, and keep overall chilling costs to a minimum. Thor-Ice IceGuns® (patent pending) are mounted on existing lines and are used to apply and manage Slurry Ice both inside and outside poultry as it passes along the chilling lines. 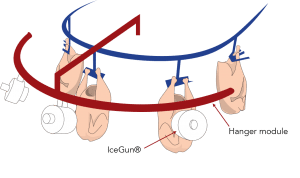 The number of IceGuns® and their position will vary for each individual processor, programmed to meet chilling requirements. Chilling can also be applied directly after defeathering or on the processing line.